For the last 22 years, Minichamps has striven to bring to the demanding collector the very best quality die-cast collectibles money can buy. With each passing year, Minichamps offers an ever wider variety of models from the major automotive manufacturer's of the world, encompassing the classic racing & road car to the contemporary models as well as current Formula 1, Moto GP, & Military models. One of the nice things about our new site is that it now allows us to highlight some of the more noteworthy items being released by each manufacturer. In the case of Minichamps, what follows is a list of some of the more intriguing products that have just arrived which we feel would be of interest to the savvy collector. 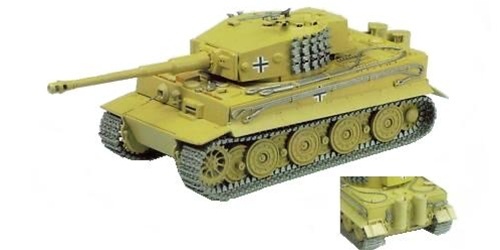 In the fall of 1942, the German Waffenant issued an order to develop a heavy assault gun to combat the growing menace posed by Russian armored forces all along the "ostfrontier" or eastern front. What resulted was the Sd. Kfz. 173 Jagdpanther tank destroyer, arguably the best long-range tank destroyer of the war. The Leopard 2 was an offshoot of the MBT-70 -- a cancelled joint development project between the USA and West Germany undertaken in the late 1960s. Even though the US had withdrawn from the project, the West Germans, under the auspices of Krauss-Maffei, continued research and development on the renamed Leopard 2 project.